So I wrote this while still in the hospital - it was fun and weird and emotional to read back through it. Our twin boys arrived on Monday, August 12th at 31 weeks, 1 day. Just some of the back story - I had been admitted to the hospital in the wee hours of the morning on the Saturday before. I woke up around midnight that Friday night, went to the bathroom (one of like 15 times during the night at that point) and started bleeding - much like a period. I didn't blog much through this pregnancy, but if you remember, I had been on house arrest due to placenta previa, etc. So bleeding was the "thing" I was really watching for and, well, there it was. I knew they would admit me. Just before 5am on Monday morning, I was lying in the bed awake. I had either just gotten up to pee or was about to, but I remember thinking, "I am feeling good, I'm free of all the monitors and IV, I'm not contracting at all, the bleeding has all but stopped... I'm going to get to go home!" And then literally a minute later, I feel the tiniest little menstrual-like cramp. I remember grabbing my belly and thinking, "Hmmm, what is that?" Within seconds I felt this big gush of fluid. One after the other. It was so much that I thought my water had broken. So I sat up and pulled back the sheets. Even in the dark, I could see pools of blood and it just kept coming. I made a mess but somehow my Snoogle made it out unscathed! I yanked it out just in time, I guess. So at first I'm thinking I should get to the bathroom, but quickly decided I better not. It was a LOT of blood coming out very fast. So I laid back down and called the nurse in. I have to again say how awesome the nurses are here! Ali was my night nurse and she was so great. If she was freaking out over my blood bath, she sure didn't show it. But within a few minutes, she had two other nurses plus Dr. Knoer in my room. Scott was already on his way back to the hospital (he had gone home around 9pm or so the night before). So they got me cleaned up and of course got me back on the monitors and IV fluids. The boys didn't seem to notice anything - they were just doing their thing in there. So the plan was to monitor everything and get my u/s first thing once the peri office opened. We knew delivery was a real possibility at this point, but I could also stabilize and hold out a while longer. Either way, going home Monday was clearly out! Ultrasound with Dr. Gomez showed healthy boys with plenty of fluid, but my cervix had opened up and I was dilated to 2.5cm. The bleeding did appear to be an abruption. Leo's placenta was sitting right by the opening of the cervix, but not covering it. Oh one other thing, as soon as they put me on the exam table (I had been taken up to u/s on a stretcher), I passed some massive clot. I was like, uh... yeah that was something. So bleeding had mostly stopped but, yeah. Anyway, Dr. Gomez also just wanted to monitor closely. It was very much a this-could-go-either-way thing right now (as far as delivering or getting stable). Plan was to see him again Thursday unless we needed to sooner. He did say I was in the early stages of preterm labor. It just becomes a question of whether you aggressively try to stop the labor or focus more on getting the boys ready to be delivered. Well, soon thereafter, getting back to my room and back on the monitors... I started contracting pretty frequently. They put me back on the magnesium drip, but it was purely for the babies and not to stop labor. The mag helps somehow neurologically and we (thankfully) had already gotten a full round of steroids in just before all this went down. So the boys were about as prepared as they could be at this stage. Dr. Ingvoldstad was now the one in charge (another OB from my practice). I did ease up on the contractions some, but it was still an hour-by-hour deal. Before too long, however, they picked up again and I also began to bleed more. Not nearly as bad as that morning, but plenty. Plenty to say, it's time! Ultimately, the decision to deliver was more about my bleeding than anything else. My blood pressure had dropped (I'm usually very normal when it comes to BP). And Dr. Ingvoldstad said it's just not worth the risk to wait. If the bleeding got really severe, you could lose one or both boys. Uh, OK let's do this then! Soon an entirely different nursing staff came in and said "Alright we'll be taking over from here." It was like when the FBI comes in and pushes out the local cops. Haha... yeah from then on things moved pretty quickly. Anesthesiology came in and we ironed all that out. Dr. Ingvoldstad thought they may want to knock me out (vs. being awake with an epidural). I told him I preferred to be alert of course, but anesthesiology could make the decision there as to what's best. Thankfully, they were cool with doing the epidural. So then it was just a matter of the OR clearing and getting in there. Oh and they also had done bloodwork on me and had blood ready to go in case I needed a transfusion. I'm so glad I was already familiar with the general procedures - it made it a lot easier knowing how the surgery process would go. They did the epidural in the OR and got me all set up and prepped before bringing Scott back. There were seriously like 15 or more people in the OR between doctors, nurses, anesthesiology, and then of course the NICU team standing by for the boys. It was a party! Surgery was quick and we heard both sweet boys cry. Lovely sound! I got a quick peek at them, but NICU had their hands on both immediately and were working away. I did lose a lot of blood during surgery and they decided to give me more. My heart rate was really low and I was apparently pale as a ghost! So the anesthesiologist got the blood started. I was seriously watching it go in, thinking of Vampire Diaries for some reason - like, oh yeah these are the bags the vamps steal from the hospital. And, hello, it hurt like a mutha going in. They were flushing it in hard and fast though. It wasn't long before I was feeling stronger and my coloring came back. But I was definitely in the OR longer than last time since they were trying to get me more stabilized. I received one more bag of blood in recovery, so that process also lasted a little longer. Scott was feeding me ice chips while in there and holy cow, they were divine. Definitely a different recovery room experience this time... no babies to hold. My counts were up after checking my bloodwork again, so I was freed to go to our new room at that point. En route to our room, they did wheel me into the NICU so I got a quick peek at our boys! No touching or holding though - just a peek. They looked great. 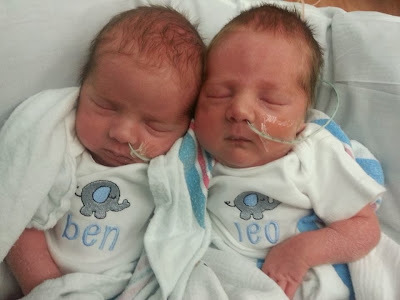 I was so thrilled that both were over 4 lbs (Leo came first at 4lb 3oz, and Ben followed at 4lb, 4oz). So that was all I saw of them on day one, but honestly all I wanted to do was sleep. I was good and drugged up and slept well Monday night. My parents had been there waiting, so we saw them and Scott was able to take them back to see the boys. My SIL and her new hubby also came by later. Scott's parents had Sam, so they were planning to come next day. I started pumping Monday night and have had some luck. Not being term, my milk will probably take longer to come in. I think they'll actually start giving them some breast milk today or tomorrow. So far, the boys are doing really well. Neither has had to be on the ventilator at this point and that is huge. Of course, in NICU things can change in a heartbeat, but so far, so good. We're just now trying to learn about all the equipment, etc. I spent most of Tuesday resting. I slept a lot and kept visitors at bay. The first 24 hrs after a C are just tough anyway, but I mean, we don't even have babies in the room with us so it's truly about me just healing right now. I was already on the verge of tears after my first attempt to pee after having my catheter removed (I've always had issues there and nothing frustrates me more!). But then the nurse came in to check my belly and I guess the pain meds weren't in full effect at that point - because oh it hurt, and I just started boo-hooing. Yesterday was rough - people (nurses, etc) constantly in and out checking on me. Just one of those leave-me-alone-and-let-me-be type days. Not to mention the constant waterworks! I was a hot mess. I did finally pee though - phew! And we did go see our munchkins again last night. Until that point, I really didn't feel up to it. Just exhausted and really sore. But we finally made it in and got to spend some "touch time" with the boys. As you can imagine, it was pretty emotional. Hard to see their little bodies and feel so helpless to do anything. They are such tiny little cuties though. Hearing the cries of other newborns down the hall has been tough. All these other moms get to have their babies with them 24/7 and I can only touch my baby through a hole in a wall. Hence my breakdown at 2am this morning after pumping! So yeah... quite a couple of days! Hoping to have the strength to shower today. That'd be glorious. We will probably be here till Friday amd then I guess down here a lot keeping up with the boys. Hard to say how long they'll be here. I'm guessing 5 or 6 weeks minimum, but who knows. Good thing is I'll have plenty of time to fully heal and get prepared to take our boys home.